This is a great spot that is never over crowded but always produces fish. 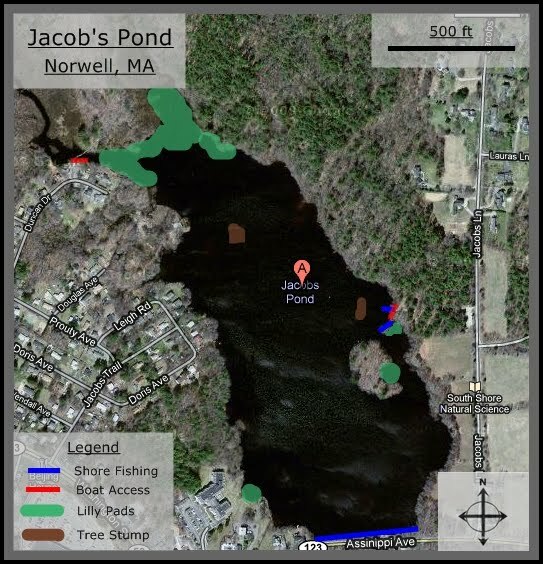 Located just over the Hanover/Norwell town line off of Route 123, Jacob's Pond is a big body of water with an abundance of fish. I've gone there a lot recently and at about 5 PM as the day starts to cool off, the fish start going crazy. If you turn onto Jacob Lane off of Route 123, about a quarter of a mile up is a parking lot. Park in there and follow the path down to the water. You will find a little dock to your right and a path out to a peninsula on the left. If you're fishing off the dock, you will see plenty of fish jumping about 75 feet out into the water, specifically around a submerged tree stump out about 100 ft. The peninsula is covered in trees but you will find about 5 access points that will allow you to fish some submerged branches, bushes that run into the water, and a large collection of lilly pads. The dock is also a great spot to fish with kids as it is often surrounded by perch and sun fish. My suggestion would be to get a canoe or a kayak out there because the access from the shore is limited but there are a lot of great spots that you can access in a boat. Unfortunately, Jacob's is a protected conservation land so there are no motors allowed out on the water. If you do take a boat out there I suggest starting at the northern end where there are a lot of lilly pads and inlets. Also in the northern section of the pond is a large submerged branch that holds a lot of fish. A friend and I dropped anchor around it and pulled about 8 fish in in about 30 minutes. If you want to drop a canoe or kayak in, I suggest getting directions to Duncan drive where you will find easy access to the water. Boat Access? Yes off Duncan Dr and Jacob Ln but no motors. After reading your post, I have tried it out today. Unfortunately I didnt bring my kayak with me, so fished from shore. Many pickerels near by the shore, especially near the lower west shore access point at the peninsula. Keep in mind, if you decide to fish from the dock, dont try jig or dive-crank bait or any lures that has open hook and dive in more than 2feet, otherwise you will be ended up spending most of your time to clean up weeds that are hidden right below the water surface. Fishing from dock can be very fun with your kids and by using real BAITS+float. If you are lure angler, I suggest to use Shad(1hook), spinner bait, plastic worms(jig), crank bait(float). Take the smaller lures, fish around shore mostly are small in size. However, there are some big ones among them! I hit this pond regularly in my kayak. If you like late day/early evening fishing then I highly recommend the topwater action. I have a lot of luck in the southeastern part of the pond around 5pm/6pm around this time of year. These areas are crammed in quarry. Ice fishing, practised by hunter-gatherers is an alluring method guidance sports where lines and hooks are lowered through a small hole in the frozen water body.